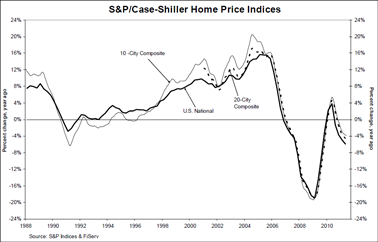 Data through June 2011, released today by S&P Indices for its S&P/Case-Shiller Home Price Indices, the leading measure of U.S. home prices, show that the U.S. National Home Price Index increased by 3.6% in the second quarter of 2011, after having fallen 4.1% in the first quarter of 2011. With the second quarter’s data, the National Index recovered from its first quarter low, but still posted an annual decline of 5.9% versus the second quarter of 2010. Nationally, home prices are back to their early 2003 levels. S&P Indices has introduced a new blog called HousingViews.com. This interactive blog delivers realtime commentary and analysis from across the Standard & Poor’s organization on a wide-range of topics impacting residential home prices, homebuilding and mortgage financing in the United States. Readers and viewers can visit the blog at www.housingviews.com, where feedback and commentary is certainly welcomed and encouraged. Keep in mind that Q2 is the traditional spring buying season, when home prices typically rise. The seasonally adjusted numbers from Q1 to Q2 were basically flat (up 0.08%).